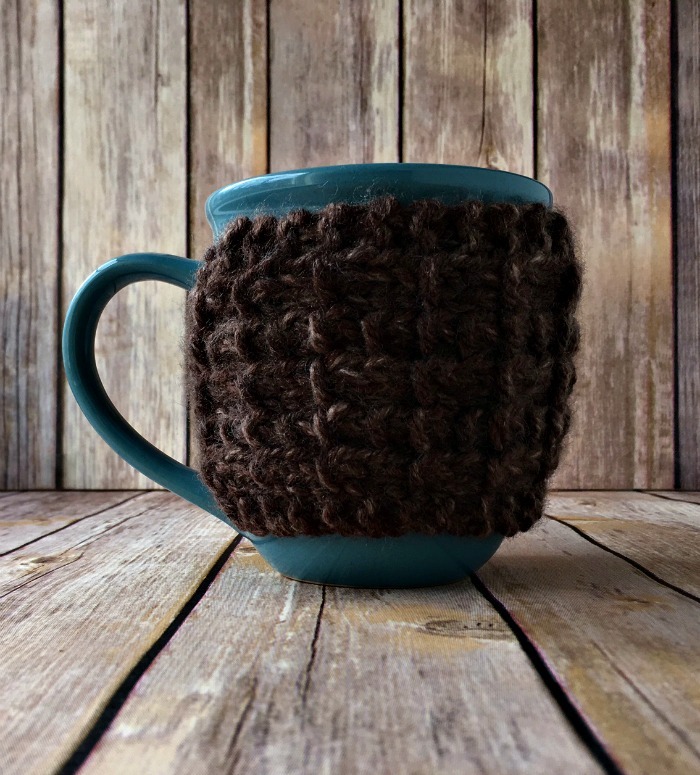 Quick Knit Coffee Cozy - Free Knitting Pattern - love. life. yarn. I will admit it – I waited until the last minute to whip up a gift. I needed to get something for my cousin and had no idea what to do so I called my mom. “What about a scarf?” she suggested. Do-able, but time consuming, and I have a bunch of published projects already in the works. “Or how about coffee? She loves coffee” my mom said. Okay, coffee was something I could just pick up at the store. But, I mean, who wants to give just a thing of coffee? So I knew at least a mug was in order and I could whip up my first ever coffee cozy in no time! I created a crochet version in 30 minutes and this version took me about 45 minutes (mostly because I’m a slow knitter, and some because my boys kept interrupting me). But even if you are a slow knitter like me this is still a Quick Knit Coffee Cozy. This is such a simple project and I wanted to spice it up by trying a stitch I’ve never used. 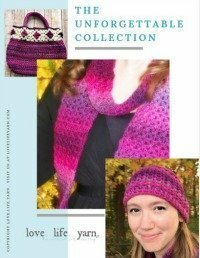 It is framed in garter stitch and the texture is created by holding the yarn in front while slipping the stitches, then transferring the stitches back to the left hand needle and knitting. The result is the longer floats that stand out as you can see in the picture below. I really like the way it turned out. Knit front and back (kfb): Knit stitch like normal but leave on LH needle, insert tip of RH needle into the backside of the loop and knit it through the back loop, then pull stitch off needle. (Increases by turning one stitch into two). Notes: This length fit my cup perfectly, but I would suggest trying it on your cup as you go to see how long it needs to be. Yours may need to be longer or shorter depending upon the cup. Row 3: K 3, bind off 2, k 3. Row 11: Kfb, k to last st, kfb – 10 sts. Row 12: Repeat row 11 – 12 sts. Row 13: Repeat row 11- 14 sts. Row 14: K 2, *with yarn in front, slip 2 sts purlwise, bring yarn to back, return 2 slipped sts to LH needle and k 2; repeat from * to last 2 sts, k2. Row 15: K2, p 10, k2. Row 16: K4, *with yarn in front, slip 2 sts purlwise, bring yarn to back, return 2 slipped sts to LH needle and k 2, k2; repeat from * to last 2 sts, k2. Row 17: K2, p10, k2. Rows 18-57: Repeat rows 14-17. Wrap cozy around cup to determine button placement. Sew on button. Weave in ends. 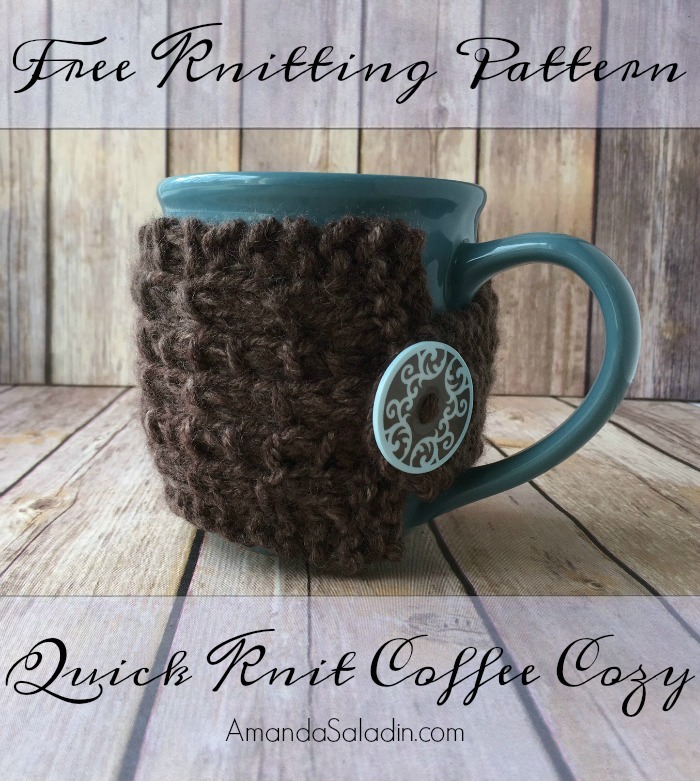 I hope you’ve enjoyed this free pattern for the Quick Knit Coffee Cozy. Happy knitting!